This post reports on a recent conversation with Dylan Beynon, a co-founder of Legal Funding Central, a recent legal tech start-up. LFC provides an online marketplace for litigation funding for plaintiffs with a focus on personal injury. 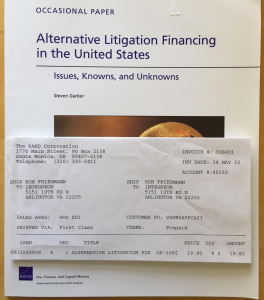 I start with background on my interest in litigation finance and close with some concluding thoughts. I suggested S&P- or Moody’s-type ratings and a litigation futures market. Those mechanisms may remain distant but litigation funding requires the same rigorous assessment of case value. Now, I read about the topic regularly. For example, litigation funder Lake Whillans writes a sponsored column at Above the Law and Corporate Counsel had a nice piece this month by Burford Capital called Litigation Finance 2.0: A Primer. So when Dylan contacted me, I was interested. Beyond legal tech and my lit finance interest, LFC seems a way to improve access to justice. I summarize here our talk about litigation funding for the masses. The company aims to extend a life line to injured people. Pursuing damages claims takes time and resources, during which time plaintiffs may need help with medical and living expenses. Waiting for courts to decide just may not be an option for many. LFC provides a market where plaintiffs in active suits can find the best deal to get funding on their claim for expenses. This helps them “avoid taking early, low-ball settlement offers from insurance companies.” Dylan and his team observed that plaintiffs had no easy way to shop around, that some funders were not clear in their advertising, that the cost of funding was high, and that the existing market suffered from a lot of friction. They built the company to fix these problems. LFC’s web-based platform streamlines a tedious process, easing pain points for plaintiffs, lawyers, and funders. The company is one year old, has 20 employees, has external funding, and has provided $5M in funding to date over several hundred cases. That, to me, seems pretty good traction for a new company offering a new type of service. Features of the platform include: plaintiffs can track their case in a dashboard, investors have a portal where they can search for prospects who meet their investment criteria, and funders can evaluate their claims more efficiently. In real time on the phone with Dylan, I signed up as a fictitious injured person and found that process nicely designed with a clean user interface and nice user experience. Dylan explained that LFC does a quick “baseline evaluation”, which means collecting enough information systematically fromplaintiffs that investors can quickly make their own determination. For example, LFC makes it easy to upload documentation. (Some cases involved 1000s of pages.) So investors must still evaluate cases. Most people use LFC on mobile devices via a browser, not an app. The website is based on HTML5 and is responsive. Dylan reports that most ethics opinions support funding. But he notes insurers would like to change that. LFC offers protections for all users, including formalizing permissions with lawyers, a five-day right to rescind the transaction, and full disclosure of fees. When we spoke, he was not aware of competition. One day later, he let me know he had just learned of what he considers the first competitor, Trial Funder. Usually I focus on legal tech for Big Law, so it was fun to shift focus to consumer law. If I got things wrong, please comment. I hope to see more markets for legal services and cases. Markets may not always offer efficiency and transparency, but can they be worse than lawyers at that? I regularly write about ways to Do Less Law for Big Law. That does not mean I would deny rights to those in need. Those with colorable claims deserve their day in court. And, by the way, in my memory, the Rand study concluded that litigation funding is not a bad thing. [Disclosures: As is almost always true when I write about a legal provider, I have no financial interest in it; I do not research the market; I do not independently verify what I hear; and I give the person the right to review and suggest changes. Dylan suggested a few minor clarifications, which I accepted].